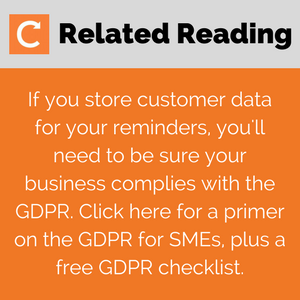 A Commusoft client recently let us know that one of the biggest pain points he faces in growing his business is reminding customers of when services and checks are due. We like to jump right on questions and suggestions from our clients here at Commusoft, so get ready to learn more than you ever thought possible about service reminders. If you missed our previous posts on service reminders, get started by checking them out now—and then we'll go even deeper into the topic. What Is a Service Reminder? This is a beginner-level tutorial that discusses why you should send reminders, when to send them, whether to use email, letter or SMS, and how to track your response rate. You don't have time. You won't be able to cope with the volume of calls. We tackle these and other excuses as to why you're neglecting to send reminders. Knowing why you're sending service reminders, and how they can help you and your customers, will motivate you to do them right. 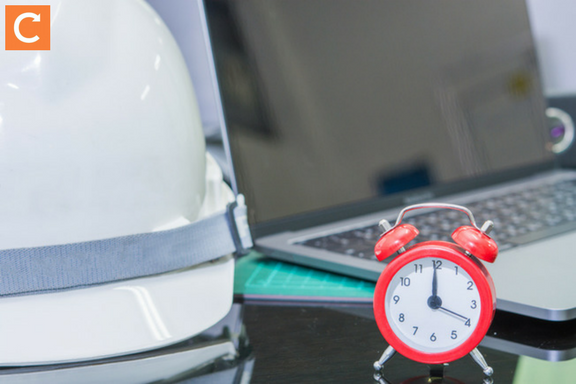 However, there's not a lot of research or literature on the effectiveness of reminders in the field service industries. Veterinarian practices: A free reminder service offered to vets by Partners for Healthy Pets resulted in 8.5 percent of all inactive clients bringing their pets in for a veterinary appointment. Response rates were highest among senior pet owners; maybe it will work the same way for customers with older boilers! Sports Marketing: A sports and entertainment marketing company sent a text reminder to customers who hadn't converted on a gift offer. The result: The response rate increased by 30%. From these and other studies and case studies we've researched, we can safely assume that reminders work across industries. A final note on the "why" is to remember that reminders are part of your service. You may fear you're annoying customers with emails or texts reminding them of needed boiler servicing, but in reality you're doing them a favour. 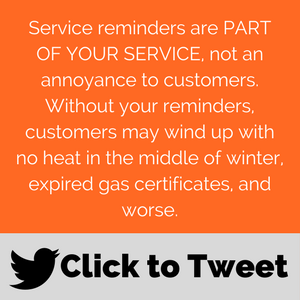 Without your reminders, your customers may wind up with no heat in the middle of winter, expired gas certificates, or worse. Keep your customers happy and comfortable by sending them service reminders. Remember the word "remember." Adding this important word to the subject line of your email (or the beginning of your letter or SMS) separates your helpful reminder from the marketing messages and junk mail bombarding your customers. Also, the positive "remember" has been shown to be more effective than "don't forget" in getting people to actually, well, remember. Greet the customer. Opening your emails with "Dear Toby" instead of leaping into the reminder keeps customers from thinking it's a mass (read: trash) email, according to an article in Fast Company. Customise it. Customer database and email software lets you create templates with tagging, which allow you to personalise the communication even beyond the “Dear Toby” greeting. For example, add the [job description] tag in Commusoft to automatically plug in the service that needs to be done. In fact, a study by the email marketing company Boomerang found that messages written at a third-grade reading level get the best response, and the sweet spot for email length is between 50 and 125 words. Call them to action. People are busy and they're inundated with email; if they have to spend a lot of time thinking about how to set their service appointment, they may keep putting it off. So be sure to end with a clear call to action that makes it easy for your customers to do what they need to do. For example, include a highly visible link for them to click and schedule their service appointment, or ask them to call your (also highly visible) number to set it up. Learn even more about how to create a powerful reminders—and download our helpful reminder templates for private customers and letting agents—by clicking on the banner at the end of this post. Here are the basics of Commusoft's service reminders. In our field service management solution, you can send reminders on a schedule that works for you (since not all services are annual); use different email and letter templates for landlords and estate agents; and send the reminders via email, letter, or SMS. See the service reminder feature in action in this video. If you prefer to send paper reminders but don't want the hassle of doing it yourself, let us here at Commusoft handle the task for you with our Print & Post feature. You simply purchase credits, and we use CFH Total Document Management Limited—one of the UK’s leading document outsource processors—to fulfil your print and post requests. Now you can customise the way the date and time show up in your reminders (and other customer communications) so your reminders are always consistent with your business's style. If you have other questions about service reminders, or requests for blog content on a particular topic, please email us at linda.formichelli@commusoft.co.uk. In the meantime, click the banner below to snag your free, downloadable service reminder templates.